This is the third installment in our new series which looks at former ARCA Racing Series Presented by RE/MAX & Menards competitors who've gone on to success in NASCAR. (3-23-10) - Ricky Stenhouse Jr. only spent one full year in the ARCA Racing Series, but it was certainly a noteworthy one. After being chosen as a development driver with Roush-Fenway Racing in 2007 at the age of 19, Stenhouse Jr. ran the full 21-race ARCA season in 2008. He posted two wins, 10 top-five and 14 top-10 finishes, along with three poles. Ricky's performance in the 2008 ARCA season confirmed that Jack Roush's confidence in him was justified. Stenhouse Jr.'s first ARCA win came in just his sixth career stock car start, after years of success in midget and sprint cars during his youth. 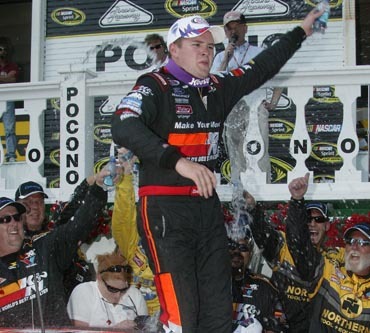 His win at Kentucky Speedway in 2008 was followed up two weeks later by a second victory at the venerable Pocono Raceway, where Stenhouse Jr. led 39 of 86 laps. The two early season victories, part of an impressive string of eight top-10 finishes in the first ten races of the year, rocketed Stenhouse Jr. to the top of the 2008 ARCA championship point standings for 13 weeks. In a highly competitive points battle that season, Ricky finished fourth, prompting Jack Roush to observe that Stenhouse had "exceeded my every expectation." Stenhouse Jr. is currently in his second year of NASCAR Nationwide Series competition and is a candidate for 2010 NNS Rookie of the Year honors. He ran seven Nationwide races in 2009 in the Roush Racing No. 16 and 17 cars, sharing seat time with Cup Series veterans like Matt Kenseth and Greg Biffle. Ricky scored two top-10 finishes in the series last year, including a ninth in Kentucky and a fifth in Milwaukee, while capturing his first career Nationwide Series pole at Iowa. The 2010 season marks Stenhouse Jr.'s first year as a full-time driver in the NASCAR Nationwide Series, now piloting the No. 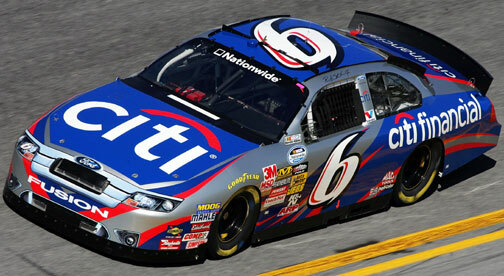 6 CitiFinancial Ford for Roush-Fenway Racing with series teammates Carl Edwards, Colin Braun, and Paul Menard. In four starts this year, Ricky started in the top-10 twice and posted a best finish of 25th at Bristol last weekend, where he led four laps. "I feel like we hung right there with some of the veterans, which gives me a lot of confidence," Stenhouse said after the race. Ricky has improved his race finishes consistently over his last three NNS starts. As he continues in pursuit of NASCAR Nationwide Series Rookie of the Year honors, Stenhouse will face stiff competition from other young drivers, including James Buescher, Brian Scott, Colin Braun and Parker Kligerman, many of whom are also past ARCA Series standouts. But, with talent and determination as good predictors of his potential, Stenhouse Jr.'s NASCAR racing career should prove to be a long and successful one.